Our next Dinner Church, the fourth in our series, will share a meal and discuss Noah’s ark and it’s tie to baptism. Mrs. Noah will introduce a different perspective on the Noah story followed by a table discussion. As in the past, food will be provided. 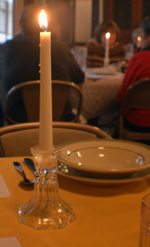 This is a time for dinner in an ancient tradition of a worship format and table discussions. All are welcome. A signup sheet is posted in the Social Room to help us plan for food. Call the Church Office for questions.